Hispanic Heritage Month is the perfect time for us as a familia to share our Hispanic heritage with little one’s friends at school, and with our community. Although Latinos are the second largest, and fastest growing minority group in the United States in our small Southern community we don’t have a large Latino presence. This is our opportunity to educate others on the beauty and richness of our heritage so they too can embrace diversity. This is significantly important due to all the negative media towards Latinos that we are seeing daily. Therefore, we need to continue to instill pride in our bilingual and multicultural child. Particularly since we live in a community where Latinos are far and few. In little one’s classroom, he only has one Hispanic friend. She too is bilingual and her parents are from Mexico. Since they are the only two Latino and bicultural children in their classroom. I approached her Mom so her daughter can participate in a special presentation activity on sharing their heritage. I thought it’d be cool for them to do it together! 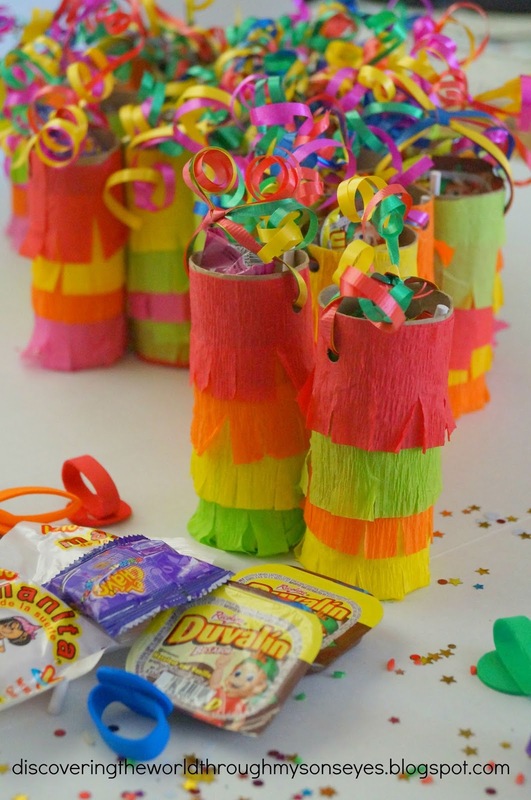 The activity includes: reading a book, talking about where their family comes from, and gifting their classmates with a mini-piñata. 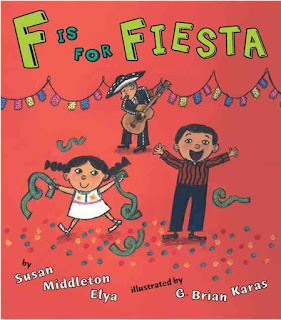 The book they both read was F is for Fiesta by Susan Middleton Elya. It’s perfect for the occasion and has enough words in Spanish for the children to read aloud, and enough words in English for their monolingual classmates to understand. The book highlights the Hispanic culture through the use of the Spanish alphabet. They each both made a tri-fold. Little one helped cut-out and glue the pictures. We also included a picture of us with the familia in Puerto Rico and another one of his Abuelo from Ecuador with both of us. He was so excited about the presentation! His friend and classmate shared a similar tri-fold with pictures and information on Mexico. 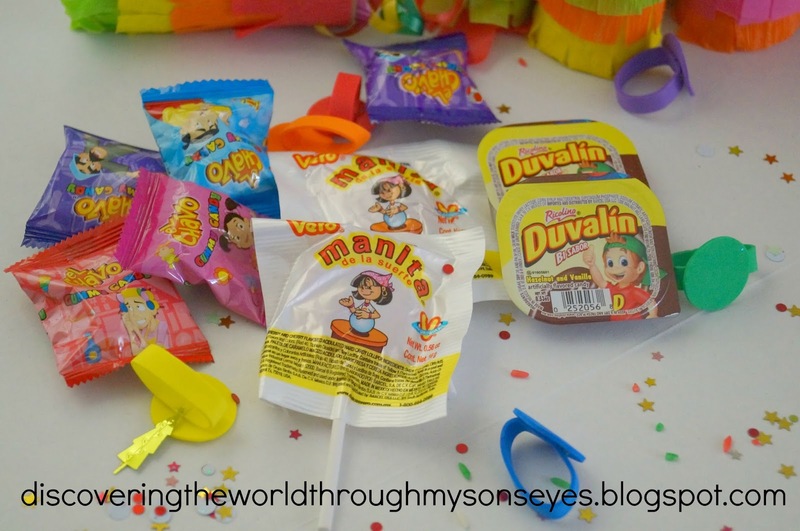 For the treats, we made mini-piñatas filled with Mexican candy. 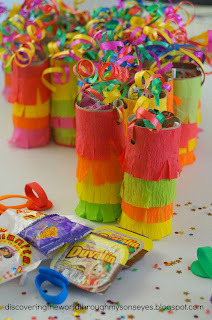 We made them out of toilet paper rolls and wrapped with colorful party streamers, and ribbon to carry. This was a fun activity to put together! 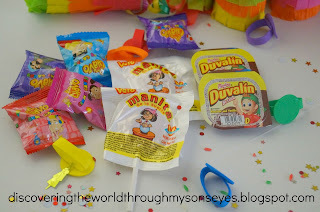 I am also grateful for little one’s friend’s mom on going along with my crazy idea and helping me make the min-piñatas while our children played in Spanish. The children’s book Abuela by Arthur Dorros was read by our child, and I had a PowerPoint presentation in which I talked about where our son’s Abuelas were from both Puerto Rico and Ecuador and valuable information on Hispanic Heritage Month. We had two different crafts: papel picado, and plastic bottle maracas. In the background, I was playing both Lucky Diaz De Aqui y de Alla and Mister G’s ABC Fiesta‘s CD. The guest were also treated to freshly made churros fried on the spot! 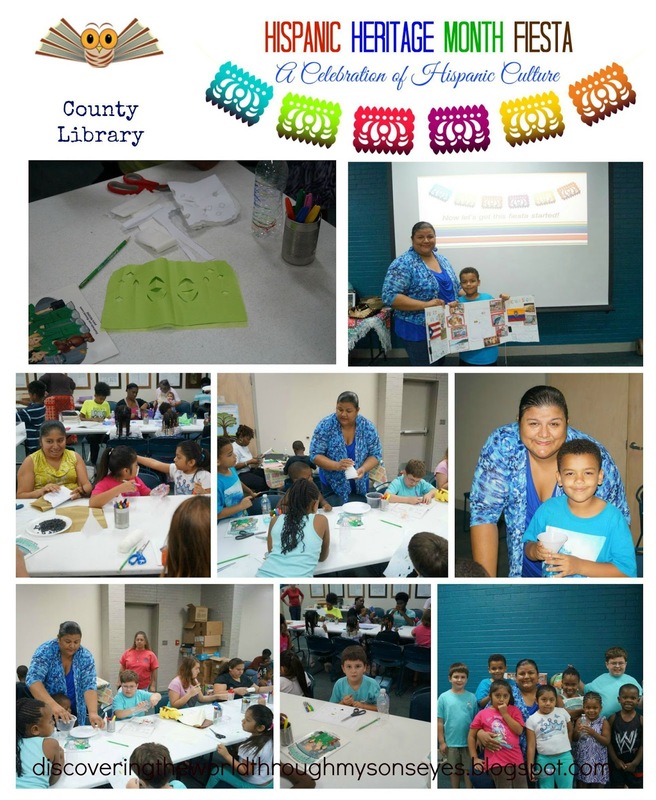 I am beyond happy with our participation celebrating Hispanic Heritage Month at the library. We had a great outcome, and our son surprised me by wanting to read the book in English/Spanish all by himself to a room full of people. I am also thankful for the emotional support my husband, and dear friends gave me their mere presence. 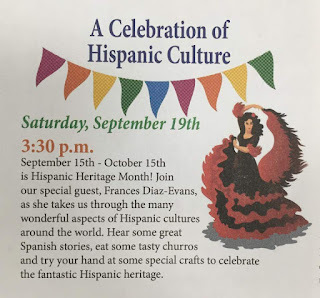 I am also eternally grateful to the director of the library on allowing me the opportunity to share the beauty and richness of our Hispanic heritage to our community. It is my hope that we’ve planted the seed of knowledge on our Hispanic culture, and heritage in the hearts of the children in our son’s classroom, and in the community. Thus bridging the gap of ignorance, and prejudice of the unknown with a new found knowledge that embraces diversity. If you liked these ideas you’ll also enjoy celebrating a Hispanic Heritage Month Fiesta in your home. It’s fun! Just invite family and friends! Follow Frances @ DTWTMSE’s board Hispanic Heritage Month on Pinterest. 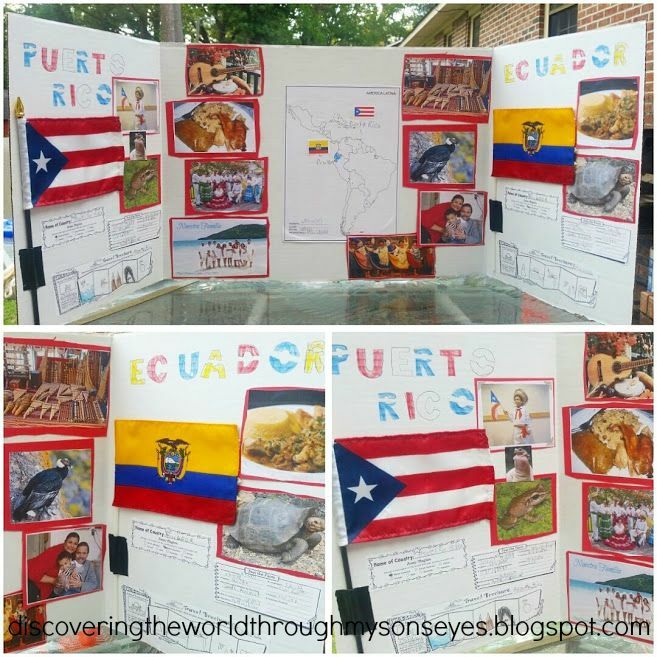 This post was created for the inclusion of Multicultural Kid Blogs 2015 Hispanic Heritage Month Series. Love all the activities you planned! Sounds like lots of fun. You should be very proud of yourself for being such a great ambassador of our Hispanic heritage. This is just so awesome! It's neat to see that the library was so excited to welcome you and your culture in to share with everyone. What a treat to your community you are!! Did you make the churros? Gracias Mariana Llanos! I like that! Great ambassador of our Hispanic Heritage. 🙂 Thanks for commenting!